The National Football League playoffs for the 1980 season began on December 28, 1980. The postseason tournament concluded with the Oakland Raiders defeating the Philadelphia Eagles in Super Bowl XV, 27–10, on January 25, 1981, at the Louisiana Superdome in New Orleans, Louisiana. NOTE: The San Diego Chargers (the AFC 1 seed) did not play the Oakland Raiders (the 4 seed) in the Divisional playoff round because both teams were in the same division. Even though the Oilers recorded more yards, more first downs, and more time of possession, the Raiders scored on big plays to win 27–7. Houston running back Earl Campbell lost a fumble on the first play of the game, setting up Oakland kicker Chris Bahr's 47-yard field goal. The Oilers responded with a 55-yard drive to take the lead on Campbell's 1-yard touchdown run. In the second quarter, Raiders quarterback Jim Plunkett completed a 37-yard pass to running back Kenny King before throwing a 1-yard touchdown pass to Todd Christensen. Oakland did not score again until the fourth quarter when Plunkett threw a 44-yard touchdown pass to Arthur Whittington. Later on, his 21-yard completion to running back Mark van Eeghen set up Bahr's 37-yard field goal. With about six minutes left in the game, cornerback Lester Hayes returned an interception 20 yards to the end zone to clinch the Raiders' victory. This would the last playoff game Oakland would host until 2000. Oilers receiver Carl Roaches set a franchise playoff record with seven punt returns for 84 yards. Quarterback Ken Stabler, a former Raider who led the team to a Super Bowl title four years earlier, threw for 243 yards, but was intercepted twice and sacked seven times. Campbell rushed for 91 yards and a score. Hayes had two interceptions, three pass deflections, and two sacks. After the game, Oilers linebacker Thomas Henderson was so upset he threw several pieces of his equipment into the stands, including his shoes. "If I wouldn't have been arrested for indecent exposure, I would have thrown them my jock strap", he said later. The Cowboys avenged a 38–14 loss to the Rams two weeks earlier (in a game they trailed 38–0) as Dallas running back Tony Dorsett rushed for 160 yards, caught three passes for 28 yards, and scored two touchdowns to lead his team to victory. A 14-yard punt return by Dallas running back James Jones set up kicker Rafael Septién's 28-yard field goal to give the Cowboys a 3-0 lead. The Rams responded by driving 73 yards to score on running back Jewerl Thomas' 1-yard run. However, the ensuing extra point was blocked and Septien later made a 29-yard field goal to tie the game at 6. In the second quarter, Los Angeles drove 80 yards in six plays to score on Vince Ferragamo's 21-yard touchdown pass to receiver Preston Dennard, who finished the game with six receptions for 117 yards, but the Cowboys tied the game before halftime by moving the ball 71 yards on a drive that ended with Dorsett's 12-yard rushing touchdown. After the game was tied at halftime, 13–13, Dallas coach Tom Landry went to a 5-man defensive front and they dropped various combinations into seven and eight man coverage to confuse the Rams potent passing game. The result was a combination of pressure on Ferragamo, who completed just five of 13 second half passes for 49 yards and was intercepted three times. Danny White threw touchdown passes on Dallas' first three drives of the second half. His 37-yard completion to tight end Jay Saldi set up a score on a 10-yard pass to Dorsett, who caught the ball at the 7 and dragged Rams defenders Johnnie Johnson and Rod Perry all the way into the end zone. Then Cowboys defensive back Aaron Mitchell picked off a pass from Ferragamo and returned it 12 yards, setting off a 70-yard Dallas drive that ended with White's 35-yard touchdown completion to Butch Johnson. Now with a comfortable lead, Dallas put the game away early in the fourth quarter, driving 95 yards, including a 23-yard burst by Dorsett, to go up 34-13 on White's 11-yard touchdown pass to Drew Pearson. Dallas then turned to a potent rushing attack to chew up time and keep the Rams offense off the field. By the end of the game, Dallas rushed 46 times for a franchise playoff record 338 yards, while also setting a franchise record for total yards with 528 and holding the Rams to 260. Jones finished the game with three kickoff returns for 72 yards, five punt returns for 81 yards, and another 38 yards on five carries. Although San Diego outgained Buffalo in total yards, 397 to 244, they still found themselves trailing for most of the game. With 2:08 left in the fourth quarter, Chargers quarterback Dan Fouts threw the game-winning 50-yard touchdown pass to receiver Ron Smith to defeat the Bills, 20–14. This was San Diego's first postseason win since 1963 (in the AFL) and their first playoff win as an NFL team. San Diego scored first with a 22-yard field goal by Rolf Benirschke on their opening drive. But the Bills stormed back with two unanswered touchdowns. First they responded to the field goal by driving 72 yards, aided by a 37-yard pass interference penalty on linebacker Ray Preston, to score on Roosevelt Leaks' 1-yard touchdown run. Late in the second quarter, Bills defensive back Charles Romes forced a fumble from Charlie Joiner that defensive back Bill Simpson recovered for Buffalo on the Chargers 33-yard line. The Bills then drove to a 14-3 lead in four plays, as Joe Ferguson completed an 18-yard pass to Frank Lewis and then found him in the end zone for a 9-yard score. However, San Diego took the second half kickoff and quickly racked up yardage with an 18-yard run by Chuck Muncie and a 45-yard completion from Fouts to Joiner. Fouts eventually finished the 70-yard drive with a 9-yard touchdown pass to Joiner, making the score 14-10. Then late in the third quarter, the Chargers forced the Bills to punt from their own 8-yard line and got the ball with great field position on the Buffalo 49. Fouts then led the team to the 1, but a penalty pushed them back and they ended up settling for Rolf Benirschke's 22-yard field goal to make it 14–13. Buffalo had a great chance to put the game away when Lou Piccone blocked a Chargers punt that was recovered by linebacker Ervin Parker on the San Diego 38. But safety Glen Edwards intercepted a pass from Ferguson on the San Diego 9-yard line to keep the Bills from scoring. With 6:17 left in regulation, Buffalo got another chance to get a decisive score when they recovered a fumbled punt return from Mike Fuller. But two plays later, defensive tackle Fred Dean dropped Joe Cribbs for a 1-yard loss on third and 1, and then Nick Mike-Mayer missed a 49-yard field goal attempt, giving the ball back to San Diego with 3:59 left. After driving to midfield, the Chargers faced third and 10 with 2:08 remaining. Buffalo sent safety Steve Freeman on a blitz for the next play, leaving Smith, San Diego's No. 3 receiver, one on one with Simpson. Earlier in the game, Simpson had knocked the ball out of Smith's hands during a catch attempt and then picked it off in mid air. But this time, Smith managed to get one step ahead of Simpson, make the catch, and evade his desperate diving tackle attempt, leaving Simpson face down on the turf as he raced 50 yards for a touchdown. Edwards sealed the victory for the Chargers after the ensuing kickoff by recording his second interception from Ferguson with 1:16 left in the game. After the game, it was revealed that Ferguson had been playing with a fractured ankle, suffered three weeks earlier in a game against the New England Patriots. He finished the day with 180 yards and a touchdown, but was intercepted three times. Fouts threw for 314 yards and two touchdowns, with one interception. His top target was receiver John Jefferson, who caught seven passes for 102 yards. Prior to this game, Ron Smith had caught only 7 passes during the season, and his 50-yard game winning score was his only catch of the game. The Eagles forced eight turnovers, seven in the second half, en route to a 31–16 victory, while also holding the Vikings to just 215 total yards, with a mere 36 on the ground. It marked a bitter repeat for Minnesota, who had lost to the Eagles 42-7 during the regular season. The Vikings scored 14 unanswered points in the first half, starting with wide receiver Sammy White's 30-yard touchdown reception from quarterback Tommy Kramer. Then after a punt, they drove 69 yards in 10 plays to score on running back Ted Brown's 1-yard touchdown run. However, Philadelphia scored before halftime by finishing off an 85-yard drive with quarterback Ron Jaworski's 9-yard touchdown completion to wide receiver Harold Carmichael. The Eagles then tied the game on the opening possession of the second half with Wilbert Montgomery's 8-yard touchdown run. Then the wave of turnovers began (11 total between both teams). First, Kramer threw a pass that was intercepted by Roynell Young on the Eagles 7-yard line. Minnesota then scored a safety when Jaworski was sacked in the end zone by Matt Blair and Doug Martin, but Reggie Wilkes recovered a fumbled punt return by Vikings running back Eddie Payton on the Minnesota 18 that set up Montgomery's 5-yard touchdown run, putting the Eagles up 21-16. With 16 seconds left in the third quarter, Eagles lineman Carl Hairston forced a recovered a fumble from Kramer on the Vikings 44-yard line. But this opportunity was wasted as Montgomery fumbled the ball back to Minnesota on the next play. Early in the fourth quarter, Eagles lineman Ken Clarke recovered a fumble from Doug Paschal, which was soon countered by Jaworski's interception to defensive back John Turner. A few plays later, Herm Edwards intercepted a pass from Kramer, only to see this later nullified by Jaworski's interception to defensive back Tom Hannon. With 9:16 left in regulation, Eagles linebacker Frank LeMaster returned an interception from Kramer seven yards to the Vikings 15, leading to Tony Franklin's 33-yard field goal to increase the Eagles lead to 24-16. Then on the Vikings next drive, Edwards intercepted another pass and returned it 14 yards to the Minnesota 31, leading to Perry Harrington's 1-yard rushing touchdown to make the final score 31-16. On the last play of the game, Young intercepted a pass from Kramer in the end zone. In a play that has become known as Red Right 88, Browns quarterback Brian Sipe's pass was intercepted in the end zone by Raiders safety Mike Davis with 41 seconds left in the game to preserve Oakland's 14–12 victory. Instead of opting for a game-winning field goal, Cleveland decided to attempt a passing play because Browns kicker Don Cockroft had previously missed two of four field goal attempts, had another aborted following a bad snap, and had one extra point blocked. In addition, the field was frozen and slippery. With the game-time temperature at 4 °F (−16 °C), the coldest NFL game since the Ice Bowl of December 31, 1967, the first quarter contained nothing but punts and interceptions, with Cleveland's Ron Bolton and Oakland's Lester Hayes each recording a pick. Near the end of the quarter, Sipe's 20-yard completion to Reggie Rucker sparked a drive inside the Raiders 30-yard line, but it ended with no points early in the second quarter when Cockroft missed a field goal attempt from 47 yards. On Oakland's ensuing drive, quarterback Jim Plunkett lost a fumble while being sacked, but their defense kept the Browns in check and Cockroft missed another field goal try, this one from 30 yards out. On Cleveland's opening drive of the second half, a 28-yard kickoff return to the 40-yard line by Charles White started off a 48-yard drive that ended with Cockroft's 30-yard field goal, retaking the lead for the Browns at 9–7. Then after forcing a punt, Cleveland drove to the Raiders 24-yard line, but on a field goal attempt, holder Paul McDonald was unable to handle a bad snap and was downed for an 11-yard loss. Starting out their next drive on the Raiders 44 after a punt, Cleveland drove to the 9, featuring a 21-yard reception by Dave Logan to score on another 30-yard field goal from Cockroft, making the score 12–7 going into the fourth quarter. Early in the final quarter, the Raiders took a 14–12 lead at the end of an 80-yard drive highlighted by Chester's 27-yard catch. On the last play, van Eeghen scored his second 1-yard touchdown run of the day. Later on, the Raiders had a chance to put the game away when they recovered a fumble from Sipe on the Browns 24-yard line with 4:19 left in the game. But after moving to a third and 1 situation on the 15, van Eeghen was stuffed for no gain on two consecutive plays. On the second play after the turnover, Sipe completed a 29-yard pass to tight end Ozzie Newsome and later a 23-yarder to Greg Pruitt. Then Mike Pruitt ran the ball 14 yards to the Raiders 14-yard line. Pruitt gained another yard on the next play, and the team called a timeout from the 13 with 49 seconds left. Browns coach Sam Rutigliano called for a pass play, Red Right 88, instructing Sipe that if no one was open "throw it to the blond in the first row". His intention was to give the team one last chance to score a touchdown before running the ball on third down to set up a Cockroft field goal. But on the pass play, Sipe was picked off by Davis while trying to connect with Newsome in the back of the end zone, allowing the Raiders to escape with a win. The quarterbacks of both teams were completely dominated throughout the game. Sipe completed just 13 of 40 passes for 183 yards and intercepted three times, while Plunkett completed only 14 of 30 passes for 149 yards, with two interceptions. Hayes and Bolton each had two interceptions. The Cowboys scored three touchdowns in the fourth quarter to come from behind and defeat the Falcons 30–27. Atlanta jumped to a 10–3 lead, aided by quarterback Steve Bartkowski's 60-yard touchdown pass to wide receiver Alfred Jenkins. In the second quarter, Dallas recovered a fumble in Atlanta territory and tied the game on quarterback Danny White's 5-yard touchdown completion to tight end Billy Joe DuPree. However, the Falcons responded with a 1-yard touchdown run by Lynn Cain to take a 17–10 lead. Then after forcing a punt, Atlanta mounted another drive into Dallas territory, but defensive back Steve Wilson intercepted a pass from Bartkowski and the score remained 17–10 at halftime. Dallas started out the second half with a drive to midfield, but lost the ball on a play that initially appeared to go in their favor. Running back Preston Pearson caught a short pass from White and took off for a big gain, but linebacker Joel Williams, who initially pressured White into making the pass, managed to chase Pearson down and force a fumble on the 15-yard line. After recovering the fumble, Atlanta stormed down the field and increased their lead to 24–10 with Bartkowski's 12-yard touchdown pass to running back William Andrews. Starting a drive with 3:38 left in the third quarter, Dallas mounted an 85-yard drive that ended with Robert Newhouse's 1-yard touchdown run with 13:50 left in the game. Dallas subsequently forced a punt, but Atlanta safety Tom Pridemore intercepted a pass from White and returned it 22 yards to the Cowboys 37-yard line, setting up a 34-yard field goal from Tim Mazzetti to increase the lead to 27–17. Dallas then marched 62 yards to score on Drew Pearson's 14-yard touchdown reception with 3:04 left in the game. Then two plays after the ensuing kickoff, Dallas lineman Ed "Too Tall" Jones appeared to jump offsides, which would have given the Falcons a first down, but managed to maintain his footing and avoid crossing the line of scrimmage before the snap. As a result, his sudden movement threw off Atlanta's offense and he ended up making a key tackle to end the drive and force a punt. Following the punt, Dallas advanced 70 yards to score on Pearson's 23-yard touchdown catch with 47 seconds left. Charlie Waters fumbled the snap on the extra point attempt, keeping the score 30–27 and giving Atlanta a chance to drive for the tying field goal. But the Falcons turned the ball over on downs before they could move it out of their own territory. Jenkins finished the game with four receptions for 155 yards. The game is featured as one of the NFL's Greatest Games as the Duel in Dixie. Oakland built a 28–7 first half lead, but had to hold off a furious comeback attempt to become the second wild card team in NFL history to make it to the Super Bowl. In the first quarter alone, Raiders quarterback Jim Plunkett completed 5/6 passes for 160 yards and two touchdowns, while also rushing for a score. On the third play of the game, Plunkett threw a pass that bounced off the hands of Kenny King and into the arms of tight end Raymond Chester, who took off to the end zone for a 65-yard touchdown reception. The Chargers seemed primed to respond, as Dan Fouts completed a 55-yard pass to Ron Smith on their first play of the next drive, but Oakland defensive back Lester Hayes, who recorded 13 interceptions in the regular season and four in the previous two playoff games, picked off a pass from Fouts and returned it 16 yards to the Raiders 25-yard line. However, the Chargers defense forced a punt and Fouts made up for his mistake on the next possession, hooking up with Charlie Joiner for a 48-yard touchdown to tie the game at 7. Oakland stormed back with 21 unanswered points. First, Plunkett's 48-yard completion to receiver Cliff Branch on third down and 20 set off a 7-play, 76-yard drive that ended with his 5-yard touchdown run. Then the Raiders defense forced a punt, and Ira Matthews returned Rick Partridge's 41-yard kick 14 yards to the Chargers 49-yard line. Four plays later, Plunkett's 21-yard touchdown pass to King made the score 21–7 with 1:35 left in the first quarter. San Diego took the ball back and drove to the Raiders 21-yard line, featuring a 28-yard completion from tight end Kellen Winslow to John Jefferson on a trick play, but safety Burgess Owens ended the drive with an interception. Following a punt, San Diego running back Mike Thomas lost a fumble that was recovered by linebacker Ted Hendricks on the Chargers 29-yard line, and the Raiders capitalized with Plunkett's 23-yard completion to Branch leading to another touchdown, this one on a 3-yard run by Mark van Eeghen, to build a 28–7 lead. Following Hank Bauer's 27-yard kickoff return to the 36-yard line, San Diego drove 64 yards in 13 plays, including a 24-yard reception by Thomas, to score on Fouts' 8-yard touchdown completion to Joiner, cutting their deficit to 28–14 with 1:05 left in the half. The Chargers continued to cut away at the Raiders lead in the second half, driving 68 yards in 12 plays on their opening drive. Two dropped passes by Jefferson in the end zone spoiled their chances for a touchdown, but Rolf Benirschke kicked a 26-yard field goal, making the score 28-17. Their defense then forced a punt, which Mike Fuller returned 28 yards to the Raiders 41-yard line. From there, San Diego took the ball all the way to the end zone, scoring on a 7-play drive that ended on Chuck Muncie's 6-yard touchdown run, cutting the deficit to 28–24. Oakland responded with a 68-yard drive, including a 22-yard completion from Plunkett to King, leading to Chris Bahr's 27-yard field goal to retake their 7-point lead. Then after a three and out, Matthews returned Partridge's next punt six yards to the Oakland 49, where the Raiders added a 33-yard field goal from Bahr to increase their lead to 34–24 with 9:46 left in the game. The Chargers then countered with a 72-yard drive ending with Benirschke's 27-yard field goal. The Raiders defense was exhausted and they implored their offense by saying "don't let them have the damn ball back"! The Raiders then held onto the ball for the last 6:52 of the game on a 15-play drive (12 runs, one pass, two quarterback kneels), with Plunkett scrambling twice on third down to pick up key first downs, to clinch the victory. Plunkett finished the game completing 14 of 18 passes for 261 yards and two touchdowns. Chester caught five passes for a career postseason high 102 yards and a touchdown. Fouts threw for 336 yards and two scores, but was intercepted twice. Joiner caught six passes for 130 yards and two touchdowns. Although Philadelphia quarterback Ron Jaworski completed only nine of 29 passes for 91 yards and was intercepted twice, running back Wilbert Montgomery led the Eagles to a victory by rushing for 194 yards and a touchdown. Dallas had been the highest scoring team in the NFL during the regular season, but against the Eagles defense, they could only gain 206 yards and score a single touchdown. They also fumbled five times, losing three of them. Dallas was forced to a three and out on their opening drive, and the kick from quarterback Danny White (who also served as the team's punter) went just 26 yards before John Sciarra returned it to the Cowboys 42-yard line. One play later, Montgomery scored on a 42-yard rushing touchdown. The Eagles earned themselves chances to score on their next two drives. However, they were stopped both times and their special teams unit failed to capitalize. First, they drove to the Dallas 23-yard line, only to have Tony Franklin's field goal attempt blocked by Dallas cornerback Aaron Mitchell. Then they drove to the Cowboys 16-yard line, where Harvey Martin sacked Jaworski on third down and a high snap on the field goal try sailed right through Jaworski's hands. Midway through the second quarter, White, who had been held to negative passing yardage, finally got the Cowboys going on a 10-play, 68-yard drive, completing an 18-yard screen pass to Tony Dorsett and a 12-yarder to Drew Pearson before Dorsett wrapped it up with a 3-yard touchdown run to tie the game. The score would remain 7–7 at halftime, due to another blown scoring chance by the Eagles when Jaworski's touchdown pass to Harold Carmichael was canceled out by a 15-yard personal foul penalty on guard Woody Peoples. In the third quarter, the first turnover of the game occurred when Philadelphia's Billy Campfield recovered a fumbled punt return from James Jones. Dallas quickly took the ball back with Anthony Dickerson's interception, but they only held on for a few plays before White lost a fumble due to a massive hit from Carl Hairston, which defensive end Dennis Harrison recovered on the Dallas 11-yard line to set up Franklin's 26-yard field goal. Dallas seemed to be in position to respond when tight end Jay Saldi made a leaping catch on the Eagles 40-yard line for a 28-yard gain, White's longest completion of the day. On the next play rookie cornerback Roynell Young stripped the ball from Dorsett, and linebacker Jerry Robinson returned it 22 yards to the Dallas 38-yard line. Six plays later, running back Leroy Harris scored a 9-yard touchdown to give the Eagles a 17–7 lead. Later on, Montgomery's 55-yard carry put the Eagles in position to put the game away, but Mitchell kept Dallas' chances alive by intercepting a pass from Jaworski in the end zone. Despite the interception, the Cowboys' offense was still unable to move the ball. For the rest of the game, the Cowboys never made it into Eagles territory, and after Philadelphia put together a 62-yard drive to score the final points of the game on Franklin's 20-yard field goal with 2:10 remaining, Young intercepted a pass from White on their final play of the game with 30 seconds remaining. 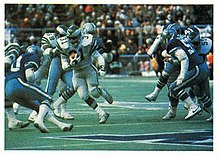 The Eagles, as the home team, elected to wear their road white jerseys instead of their home green jerseys so as to force Dallas to wear their rarely used blue jerseys rather than their familiar white jerseys; through the years, the Cowboys' blue jerseys were said to be jinxed since they often lost wearing them – especially in Super Bowl V. This would be the last game in which the Cowboys wore their royal blue jerseys; in 1981, they debuted a new navy blue uniform with a significantly different and darker shade of blue than that still used for the numbers on their white jerseys. Montgomery finished with more all-purpose yards (208) then the entire Cowboys offense. This was the first time Dallas had ever allowed an opposing player to rush for over 100 yards in team postseason history. This would be the Eagles' last playoff victory until the 1992 season. Super Bowl XV began a five-game postseason losing streak for the franchise.